Roaring Brook Press, 9781250153562, 48pp. When devastating news rattles a young girl's community, her normally attentive parents and neighbors are suddenly exhausted and distracted. At school, her teacher tells the class to look for the helpers—the good people working to make things better in big and small ways. She wants more than anything to help in a BIG way, but maybe she can start with one small act of kindness instead . . . and then another, and another.Small things can compound, after all, to make a world of difference. 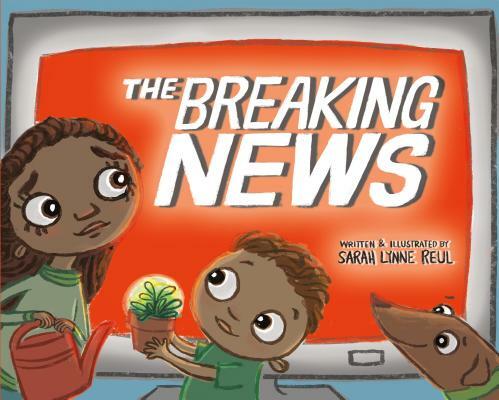 The Breaking News by Sarah Lynne Reul touches on themes of community, resilience, and optimism with an authenticity that will resonate with readers young and old. Sarah Lynne Reul is an illustrator and award-winning 2D animator who likes science, bright colors and figuring out how things work. After a number of years in science museum education and non-profit administration, she was lured back to school by the magic of making drawings come to life. She earned an MFA in 2D Animation from the Academy of Art University and her thesis film, “The Search for the Monster of Lake Quannapowitt”, won Best Animation for Kids at Animation Block Party 2015. Sarah Lynne strives to pack all the dynamic energy of animation into each of her illustrations. Originally from Brooklyn, she now lives just outside of Boston with her husband and two little girls. Sarah is the author and illustrator of The Breaking News.